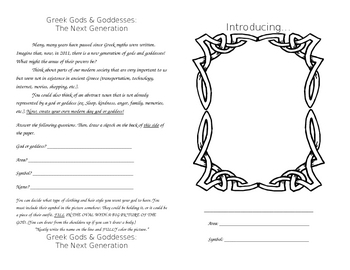 This is an activity that can be used after studying Greek Mythology. Students are asked to think of all the new inventions and technologies that we have now, as compared to when the Greeks created their mythical figures. Then, they are to create a new God or Goddess in the year 2011, with a description and a drawing of the God/ Goddess.